I was very fortunate to work in Maricopa County Elections Department under County Recorder Helen Purcell and Elections Director Karen Osborne. I would not be doing the work that I do today without their tutelage and the support they provided for the eleven years I worked in their office so I jumped at the chance to do an interview for electionline.org to share with you some words of wisdom from one of our nation’s very best. Tammy: It is always interesting to find out the path of election administrators. How did you get into elections? What prompted you to run for County Recorder? Helen: In the mid-80s I served for 4 or 5 years as the voter registration chair for the Republican party and was frustrated with the responsiveness of the Recorder’s office. It was very difficult to get any information out of them. I had always said that I never wanted to run for office, but something had to be done. Although it has gotten somewhat better than it was in those days, often times women have to have more qualifications than men do—they aren’t asked “what are your qualifications to run for Recorder?”—but I had qualifications as I had worked for years with mortgage recordings in addition to the voter registration. I ran against the incumbent, also a Republican. He wasn’t happy about it. He decided not to run for Recorder and instead had an unsuccessful Board of Supervisors bid. Tammy: Elections and the recording of documents changed dramatically over your tenure in Maricopa County, with you at the helm. What do you see as the most impactful changes that were implemented? Helen: Things have certainly changed since I was first elected in 1988. In 1996 we moved away from punch cards and took the monumental step to optical scan equipment because of the issues we were seeing with the punch card machines. When the 2000 debacle hit along with the Help America Vote Act, we were glad we were ahead of the curve. We implemented early voting to expand chances for voters to participate. Now the majority of our voters choose to vote that way; in some elections, upwards of 90 percent of the ballots cast will be early. Although Motor Voter was in place, it expanded to include online voter registration. Tammy: So, basically every facet of elections has changed over your time in office from the way voters get on the rolls, when they can vote, and the equipment used to capture their intent. Helen: Yes, and that is just the election-side of the office. When I walked into the office back in 1988 it was wall to wall paper. Each document was manually hand-stamped and entered into the system. Now more than 80 percent of our documents are filed electronically. We have positioned 10 recording kiosks around the county to better serve the public and remove the necessity to drive downtown. Electronic filing also has the added benefit of making that document more readily available to the public online. We went back and digitized images, estimated at more than 190 million documents, as far back as 1871 (Arizona became a state in 1912). One of the reasons we were able to do some of what we did was because of the Recorder’s Surcharge. Legislation had been passed before I took office to establish a surcharge fund for use on technology in the office. It was slated to sunset and we fought very hard to make it a permanent funding stream—one that doesn’t compete with other departments and that is controlled by our office. Tammy: Over the years you served on the EAC Advisory Board and TGDC [the Technical Guidelines Development Committee] and in many leadership roles at NACO [the National Association of Counties] focusing on leveraging technology to improve the services we provide to the public in a secure and tested fashion. How important is it, do you think, for such efforts to continue? Helen: It is incredibly important because every level of government informs the process and we have much to learn from each other. After 2000 and the implementation of HAVA it became very apparent that we need to have some common processes in handling election administration. It would be a horrendous wrong if the EAC didn’t continue. The voter guides and other resources particularly benefit small jurisdictions by offering assistance and have been a tremendous help in getting an election right and possibly save some money while they’re at it. We would be in a world of hurt without such an experienced body working on standards, testing, and certification. The certification program has come a long way and having testable standards is critical for election officials and the integrity of the process. Tammy: Your office recorded hundreds of millions of documents and counted hundreds of millions of ballots over your career. What advice can you provide to other administrators on keeping staff motivated when the workload gets hectic and the hours long (during candidate filing, voter registration deadlines, canvasing, etc.)? Helen: Did you ever feel like if you had an idea you could bring it to me? Tammy: Of course, your door was always open! Helen: The best office environment encourage staff to solve problems and have ideas about how to improve, but then also to provide the tools necessary to see that through and make it work. If you do that then there is a personal investment and few balk at the work load because they want it to be successful. You want everyone to succeed—the people you work with are like your family. Tammy: What do you see as the next chapter in elections, where the field is moving? Helen: Security of new systems will be very important. You want to encourage the next bright idea, but you have to be sure that the new way is safe and has integrity. Tammy: There are a handful of public servants like yourself who stayed in the field for a long time, past the point when colleagues retired. Why? Why did you decide to keep running? Helen: Quite simply, I loved my job and the people that I worked with. The ability to share ideas on the national level and get to that next best thing on the horizon—that was my driving force, sometimes to the detriment to my family life. But we all make those sacrifices for the love of the work and what it means. 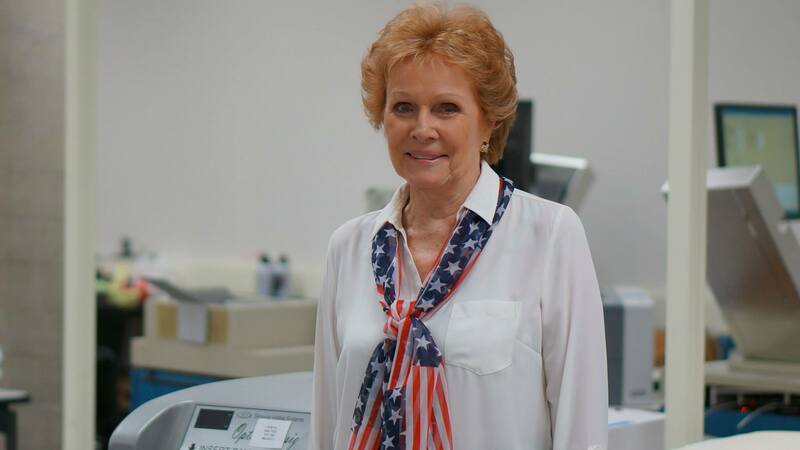 It’s undeniable that Helen Purcell has contributed so much to election administration in the United States. Thanks to her for her years of service – including helping make Tammy Patrick the force in the field she is today! Thanks also for Mindy for the fantastic idea to set up and share their conversation with the community. Be the first to comment on "Helen Purcell’s electionline “Exit Interview” with Tammy Patrick"